Ridge gourd is slightly peeled and chopped into pieces. It is then cooked in freshly prepared mint leaves green chili mixture till soft. Serve ridge gourd mint curry over plain steamed rice or with roti. Lightly peel, wash, remove ends and chop ridge gourd into small chunks (around 2 Cups). Separate and thoroughly wash mint leaves. Heat few drops of oil in a small pan on medium high flame, add green chiles and mint leaves. Fry till mint leaves start to change color and crisp up. Remove from heat and crush the mint leaves, green chiles and salt into coarse paste using a pestle. When mustard seeds start spluttering, add ridge gourd pieces, onion and salt. Cook covered on low flame till ridge gourd pieces are half cooked. Stir in freshly made mint green chili paste and cook covered for another few mintues for ridge gourd to absorb all the flavors and at the same time become soft. Uncover and stir fry for few seconds if desired to evaporate some of the moisture. Serve ridge gourd mint curry over plain steamed rice or with roti. Notes: Make sure ridge gourd pieces are cooked well before removing from heat. 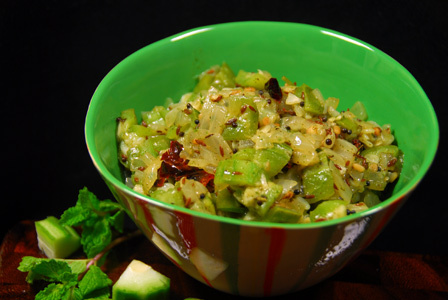 Suggestions: If ridge gourd pieces are not cooked, add few tablespoons of water and cook covered till done. Adjust spice with green chiles. Add more mint leaves if desired. Choose tender ridge gourd if possible so you don’t have to peel the skin as much. Variations: Check out ridge gourd sesame curry here. Other Names: Ridge Gourd Curry with Mint, Beerakaya Pudina Kura. Makes: around half a Cup of Mint Tomato Chutney. Wash and roughly chop the mint leaves. Heat a pan on low heat, roast chana dal, red chillies and coriander seeds separately until aromatic or until they change color. Cool the roasted ingredients to room temperature. Heat oil in a pan, add mint leaves and fry till they turn wilt and start to change color. Remove mint leaves on to a bowl. Add chopped tomatoes to the same pan, add salt and cook till tomatoes turn soft and mixture is thick. Remove the tomatoes onto the same bowl. Grind chana dal, red chili, coriander seeds mixture into smooth powder using a spice grinder. Add the fried tomatoes and mint leaves and grind again into paste. Remove the mint tomato chutney onto a bowl. When mustard seeds start spluttering, remove from heat and add to above mint tomato chutney bowl. Notes: Make sure not to burn any of the ingredients while frying. Other Names: Mint Tomato Chutney, Pudina Tomato Pachadi. Whole wheat flour is kneaded into a dough. The dough is rolled out and dried mint leaves are sprinkled on the paratha. Cook the mint parata and serve with any raita of your choice. Click here for making dried mint leaves. 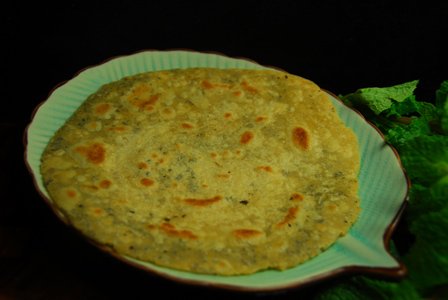 Makes: around 2 Mint Paratha. In a mixing bowl, knead together wheat flour and few pinches of salt into smooth dough using enough water. Keep the dough covered for around half an hour. Roll out each portion into thick 6 inch diameter disc. Apply few drops of ghee on the rolled out parata. Sprinkle dried mint leaves over the greased area. Roll the disc into a long cylinder and finally make a coil with it. Press the coil into flat disc and roll out into around 6 inch diameter disc with help of rolling pin. Heat a flat pan on medium heat, place the rolled out mint parata. Cook the parata on both sides till brown spots appear on the surfaces. Serve mint parata with any raita of your choice. Notes: Make sure to cook the parata well. Suggestions: Adjust mint leaves according to your preference. Variations: You can also check other recipes with mint here. Other Names: Mint Paratha, Pudina Parata. Mint leaves are washed and roughly chopped along with cilantro. Garlic and ginger are briefly fried in oil along with green chiles. Grind the mixture into paste along with lemon juice. 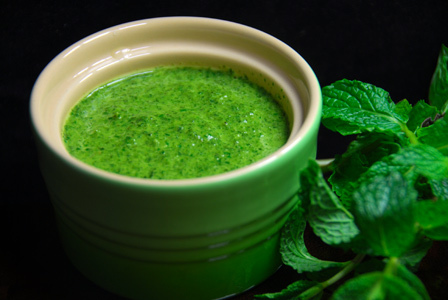 Serve mint cilantro chutney with bread or with snacks etc..
Makes: around 1 Cup of Mint Cilantro Chutney. Wash and roughly chop the cilantro. Wash, separate mint leaves and roughly chop them. Heat oil in a pan, add ginger and garlic. Fry for few seconds, add the green chiles. Fry briefly, stir in mint leaves and cilantro. Cool to room temperature and grind the mint cilantro mixture with lemon juice and salt into paste. 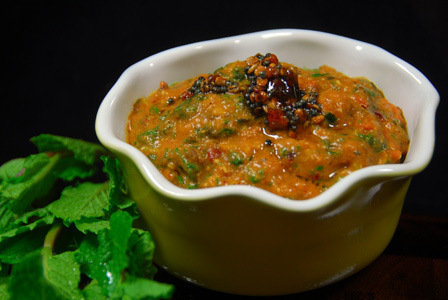 Serve mint cilantro chutney with bread or with snacks etc..
Notes: Make sure not to overcook mint or cilantro leaves. Suggestions: Adjust green chiles according to spice preference. Variations: You can also add fresh grated coconut before grinding the chutney. You can also add onion to the pan along with green chiles. Other Names: Mint Cilantro Chutney. This is a fresh, flavorful and quick salad prepared with cucumber. 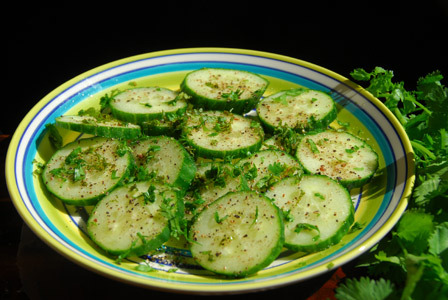 Cucumber is sliced and layered with spices and freshly chopped herbs like mint and cilantro. Serve cucumber pepper salad immediately or within few hours of preparation. Makes: around 3 Servings of Cucumber Pepper Salad. Wash the cucumber, remove little bit of both ends and slice into thick circles. Wash, separate mint leaves and finely chop them. Arrange cucumber slices on a plate. Squeeze half of a fresh lemon on the cucumber slices. Sprinkle salt and freshly ground black pepper powder. Layer with chopped mint leaves and cilantro leaves. Serve cucumber pepper salad immediately. Notes: Make sure cucumber is chilled in refrigerator before using. Suggestions: Adjust the spice with black pepper powder. Other Names: Cucumber Pepper Salad.